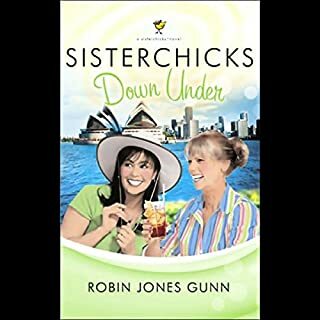 Sisterchicks Down Under transports listeners to New Zealand, where an American finds her world turned upside-down. Kathleen and her husband, Tony, have lived in suburban California for years. When Tony is offered a three-month filming job in Wellington, New Zealand, the couple looks forward to the move. But Kathleen is depressed by their tiny rental apartment in Wellington. Being alone each day while Tony works disheartens her even more. What she needs is a sisterchick. It amazes me how Robin Jones Gunn continues to come up with interesting, meaningful stories that draw in the reader/listener. I can hardly wait to go to New Zealand now!